Reached #1 on the App Store in over 68 Countries! Drust mac Erp and his savage Picts have overrun Northern Britain. King Lot of Lothian is dead. His widowed queen, Morgause, appeals to her half-brother Arthur for help. It’s up to you to answer Arthur’s call and save the Kingdom! Log in daily, participate in tournaments, and earn valuable prizes! 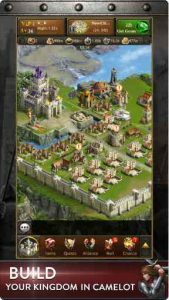 Rule the medieval realm to become the most powerful King! I have placed this game for quite I long time I just started a new acc a couple days back just to start again. But I got signed out of it tried signing back in to my acc I got the pass and email right but it wouldn’t let me join because I was supposedly already logged into the acc that I was signed out of ?